Poor New Zealand. Nobody is quite sure exactly where it is. A favorite joke on tourists in Sydney, my Australian friends tell me, is to convince them that the Sydney Harbor Bridge is actually a bridge to New Zealand (it isn’t, New Zealand is about 1,400 miles away). And the HBO show Flight Of The Conchords has made ignorance of New Zealand a running theme. But at the very least Google should get it right. 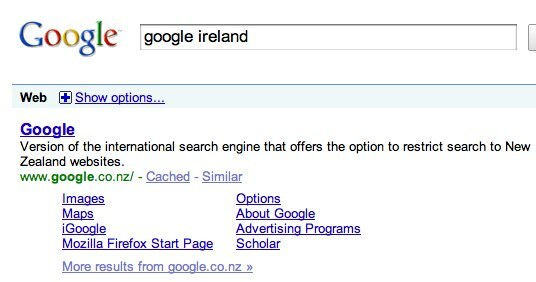 But Barry Schwartz has noticed that the top result for a search for Google Ireland on Google itself returns a top result of not Google.ie, but Google.nz. As does a search for Google Egypt. Neither Ireland nor Egypt are actually New Zealand. It’s in a totally different hemisphere.